Once upon a time there was a school in South Wales with a beautiful traditional slate roof. Sadly the school roof had a vandal issue, The school was full of children wanting to learn, yet their classrooms were full of buckets catching the rain as it leaked through the roof. In the winter when the snow fell the children would freeze as the cold would come through the leaky roof as over the years the rain has destroyed the insulation in the loft and eventually the snow would melt and water comes through the roof again. This vandal issue was costing £4563 a year for the school to maintain but never solve. 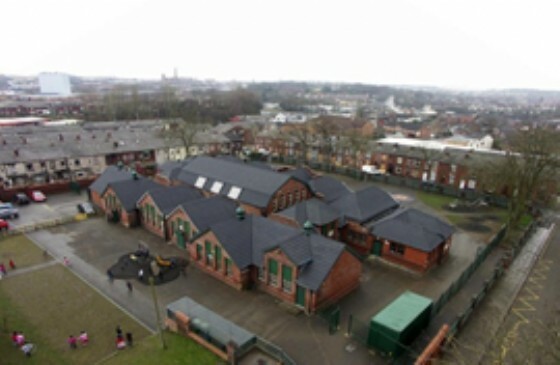 By installing a Britmet 0.9mm anti-vandal Slate 2000 lightweight roofing system, the school roof still has the appearance of its beautiful slate roof but it is now virtually maintenance free. The insulation in the loft no longer gets damaged when it rains so the school is warmer, the ceiling is no longer damaged by rain leaking through. The Slate 2000 has a 40 year BBA approval and is colour fast so it will always look aesthetically pleasing. The £4563 a year cost is now no more, a saving that be can put towards essential items such as books or equipment for the children. This is a strong case for using Britmet Tileform for all your roofing requirements. Contact Us Now.